Brand New Release - Tropez Apartments; Small Boutique building of only 27 apartments! Set high on the hill just above the heritage site of Jacks Magazine, Tropez residences offers the perfect opportunity to become part of this much sought after waterside community. Set upon premium land with just 27 exclusive apartments, they incorporate elegant architecture, stylish interior design, luxurious finishes and ecologically sustainable designs. Apartment 301 is the largest of the Tropez apartments with 92m2 of living space, 2 double bedrooms with built in robes, master with ensuite, central bathroom, kitchen with stone bench tops and stainless steel appliances, open plan living opening out to your private terrace, euro laundry, 2 secure car parks and enclosed storage. This is the only remaining apartment of this floor type. Highly convenient location only 7kms from the heart of Melbourne's CBD, various modes of public transport on your doorstep, close to schools, shops and restaurants this development enhances the pleasure of living. 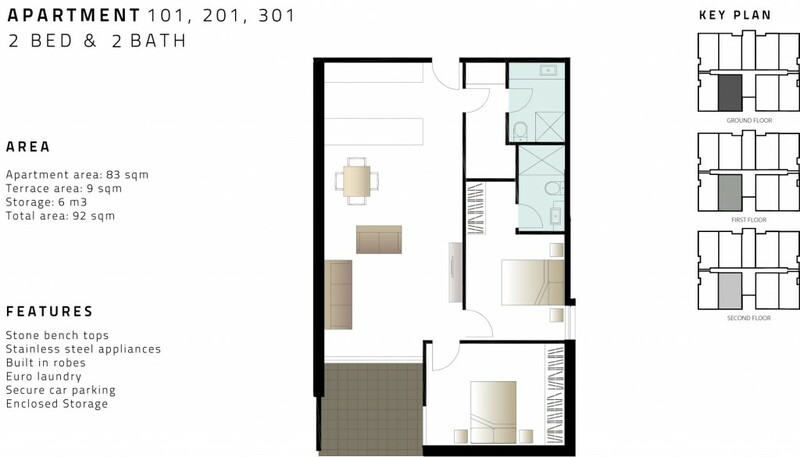 Anticipated rental return $495pw, construction is due to commence September 2011 and completion by November 2012.